Very popular at the bar, you will often see groups of people drinking Jäger bombs together. You will either love this drink or hate it; there is not much middle ground with this potent shot. Without a doubt, this is a drink every bartender should know. Jägermeister is a strong liqueur with a slight anise taste. The "depressant" effects of the alcohol are offset by the energy drink Red Bull that it is dropped into, which can definitely help keep the party going. And yet, this is not a shot for lightweights or the faint of heart and it is very easy to have one too many without realizing it. The best advice: Take it easy on the Jäger bombs. Fill a shot glass with Jägermeister. Pour half a can of Red Bull into a highball glass (or other tall glass). Drop the shot glass into the taller glass. Some people prefer to pour the shot of Jäger directly into the Red Bull, forgoing the "bomb" altogether. This can make it easier to drink without altering the taste in any way. If you opt for the drop, be careful so the shot glass doesn't hit your teeth hard as you could crack a tooth. How Strong Is a Jäger Bomb? Despite its notorious reputation, the Jäger bomb is not a very strong drink. 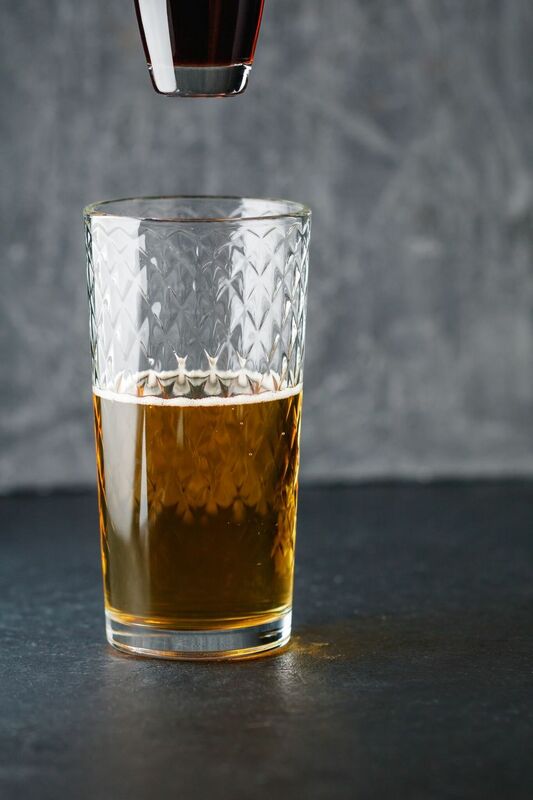 You can expect it to have an alcohol content of just 7 percent ABV (14 proof), or slightly stronger than the average beer. As many people can attest, it is easy to have one too many and end up with a vicious hangover, though. A lot of the drink's reputation for getting people really drunk likely comes from drinking too much because it makes you feel like you can keep going all night. The combination of Jäger's herbs with the energy drink is also intense. For some people, it may have negative effects on the body, causing you to feel worse than you might with straight alcohol. If you have a favorite energy drink other than Red Bull, there's nothing wrong with pouring that instead. But do realize that you will get Red Bull when ordering it at a bar. If you enjoy the interactive play that is a "drop shot," try the Irish car bomb. It drops a shot of Irish whiskey and Irish cream into a half-pint of Guinness.